THE path to a dream home and a resort lifestyle was relatively smooth for retired couple Jenny Lye and Siaw Hooi Chuan, who were among the first to buy into the concept and build a house on Sentosa. Outdoor swimming pool at retired couple Jenny Lye and Siaw Hooi Chuan's two-and-a-half storey bungalow in a residential enclave on Sentosa. They moved into their two-and-a-half storey bungalow on a pretty corner lot in 2008 and watched with interest as their neighbourhood transformed from an exclusive construction site into a residential enclave where people had a shared love of the water and more time to be neighbourly. In fact, the design process was so stress-free that the only blip came when Ms Lye discovered how much their high-end home entertainment system was going to cost. They had wandered into Clarity – one of the specialist stores at audiophile haunt The Adelphi – found a person who could explain home theatre systems to their satisfaction and faster than you can say ‘Mark Levinson’, agreed to install a high-end system. Later, they decided to expand their purchase to include additional entertainment zones throughout the house. Or rather Mr Siaw did. His wife balked at the cost (some way into the six figures), reasoning that they could buy an apartment in Penang (where they both come from) for much less. ‘After we decided to build the house, that’s the only thing we quarrelled about,’ she says, adding that she was eventually persuaded to see the value in having a dedicated entertainment room with a high-definition projector TV and a sweet sound system. As it turned out, the home entertainment system was a good investment, says Ms Lye, a friendly, vivacious woman with a constant sparkle in her eyes. The family that sings together also stays home together, it seems. ‘I’m tone death (sic), but my husband is a pretty good singer – I’ve learned to appreciate the system,’ she says. Before retirement, she worked as a lawyer while her husband had a senior position at a well-known multi-national, so when the opportunity to move to Sentosa from the city arrived, they decided to embrace the change in lifestyle with enthusiasm. ‘Previously, we were busy with our careers so we wanted a house for family and friends to enjoy,’ she says. That’s where the resort lifestyle comes in. Apart from the main home theatre, which occupies a long, narrow room in the basement, a ground-floor bedroom serves as a home spa, with an outdoor Jacuzzi, steam room and a view of the swimming pool and waterway beyond. ‘The house was conceived for us to enjoy the type of life we never had time for in the past,’ says Ms Lye, who now runs a consultancy business with her husband, allowing for a more flexible schedule. ‘The whole space was designed more like a pavilion for resort living rather than an urban home,’ says designer Angie Chan, who worked on the interior of the house, which succeeds in blurring the line between the indoor and outdoor spaces. Water features prominently throughout as well. ‘A lot of talk was about having friends over, rather than how they actually wanted to live – I told them that if they want to live on Sentosa, they should embrace the lifestyle,’ says Chan. 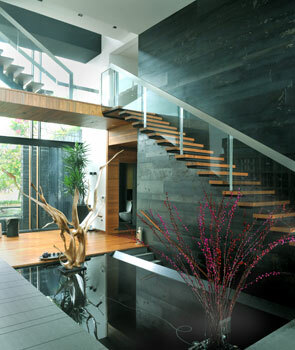 The built-up area measures about 8,000 square feet, but feels significantly larger because of high ceilings, a double-height entryway with a ‘floating’ staircase with an aerial walkway, and glass walls that open up to bring the outdoors in. Living in an ‘open plan’ concept required some adjustment, but the benefits are now appreciated. Most of the rooms were designed to be flexible, to allow for changes in individual requirements. For example, the basement home entertainment room was originally intended to be a study, while none of the bedrooms were designed for any specific household member – the occupants include a teenage daughter and a 10-year-old son, while an older son lives and works overseas. ‘The great thing about this place is that it’s multi-purpose and multi-functional,’ says Ms Lye. 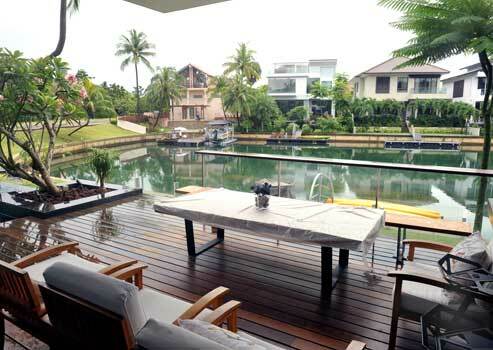 The living and dining area opens out to a covered deck which includes a bar – popular among the neighbours – and the inevitable LCD TV, but the main attraction is a private boat dock that is a feature of all the homes along this stretch, and views of neighbouring houses across the water. Mr Siaw is in the process of looking for something appropriate to moor there, but in the meantime, the family canoes – Ms Lye calls them the ‘recession boats’ – are parked there. After a short demonstration of the basement home theatre system, where every hair in Andrea Bocelli’s beard was perfectly defined and every quiver in his voice was crystal clear, it’s little wonder that Ms Lye has no regrets about splurging for the system. ‘It’s highly recommended – it encourages families to spend time together and keeps husbands at home,’ she says with a laugh. A licensed and proactive real estate professional, Jack goes beyond just sourcing and marketing real estate properties. Efficient and approachable, he makes the whole experience easy and stress-free. This entry was posted in Others and tagged English Property News, Resort Lifestyle, Sentosa Bungalow, Sentosa Lifestyle, Singapore. Bookmark the permalink.